Müller-Thurgau is a white grape variety created by Dr. Hermann Müller from the Swiss Canton of Thurgau in the 1880s. The goal was to cross Riesling, capturing its rich, complex flavors, with the earlier ripening Sylvaner. However, neither of these goals was achieved, nor was Sylvaner crossed with Riesling. DNA fingerprinting has revealed that Müller-Thurgau is a cross of Riesling and a grape called Madeleine Royale. The latter, as it turns out, is a cross of Pinot and Trolliger. Most widely planted in Germany, Müller-Thurgau is also found in Austria, Northern Italy, Switzerland, Czech Republic, Japan, and of course, the United States. 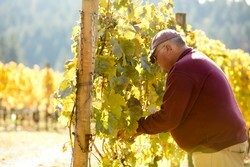 In 1980, vineyard owner Keith Kramer took a viticulture class at Erath every other Saturday for three months. The instructor Al Holstein, had some Müller-Thurgau planted in his vineyard. This was very exciting to another student in the class, who peppered Holstein with questions about the grape. Keith was not very interested in Müller-Thurgau initially, but the guy “made such a stink about it” that when the Kramers had an opportunity to buy some fruit from Courting Hill Vineyard a few years later they decided to try it. That first wine was a very fruity, off-dry white that had enough potential that they went ahead and procured some starts from Sokol Blosser in the mid-1980s. Müller-Thurgau was among the first wines in our tasting room for our grand opening in 1990, and it quickly gained a following. We increased the acreage in our estate vineyard to three, which does not sound like much, but this variety routinely produces 4-6 tons to the acre, double or triple the yield compared to Pinot Noir. As our production grew, we experimented with assorted styles, including a sparkling wine, a dessert wine, a dry barrel-fermented wine, and a late harvest wine. The stainless, fruity Estate bottling is our most popular wine, followed by the Celebrate sparkling wine. It is easy to see why Muller-Thurgau is a tasting room favorite. In a region full of Pinot Gris, and to a lesser extent Chardonnay and Riesling, Müller-Thurgau stands out. Its unique flavor profile with starfruit, lychee, melon, hints of orange blossom and gardenia, gentle acidity with a sweet and sour effect on the palate makes it easy to sip. Plus, Müller ripens at lower sugar levels, so the alcohols in the finished wines are lower than many table wines, usually around 11%.